Two Los Angeles City Council committees approved a comprehensive plan Wednesday for a regulated permit system for street vending, which would end the city’s distinction as the nation’s only major municipality that bans the practice. The City Council in February voted to stop making street vending punishable with a misdemeanor criminal charge, although it is being penalized through citations as the council works on the permit system for the industry. The proposal for the permit system was drafted by the Chief Legislative Analyst (CLA) and was approved without objection at a joint meeting of the Economic Development Committee and the Public Works and Gang Reduction Committee. The permitting proposals include provisions such as limiting vendors to two per block in many locations. While some of the provisions are opposed by vendors, there has been wide support in the industry for the effort to decriminalize street vending. One provision sparking debate would require businesses on a block to sign a letter of approval allowing the vendor to operate, which is something the council had recommended previously. Although the CLA report did not state a preference on the issue, it said if the council wished to adopt it, the panel should consult with the city attorney in closed session as to the provision’s legality. The committees added an amendment to the report that would direct the city attorney and CLA to consider allowing businesses to opt out of having vending on their block rather than having all businesses sign a letter opting in. The idea of requiring businesses to opt in or allowing them to opt out has been opposed by some street vending organizations and advocates. The CLA report outlines a plan to create a list of additional “non-vending” areas that may include alleys and city-owned property, while creating a process for certain streets to be named “non-vending” areas by City Council action. The estimated cost for potential enforcement models contained in the report could range between $3.37 million to $5.87 million. To recover those costs through permit fees of $125, between 26,950 and 46,885 certificates would have to be issued. The report also estimates that the first year of operation for legalized street vending could cost a vendor between $2,932 and $21,861 in overhead due to equipment purchases, fees, permits, insurance and inspection costs, although it recommends a number of ways to reduce the cost to vendors, including exploring the feasibility of contracting with a manufacturer that would produce carts that have already received plan-check approval from the county. The report also recommends that once the total number of available vending locations has been determined by the council, that the Economic and Workforce Development Department be instructed to develop a lottery system that reserves a percentage of the certificates of operation for disadvantaged individuals. The report recommends banning vending near schools unless only fruits and vegetables are being sold, and also banning it near popular venues like Dodger Stadium and the Hollywood Bowl. 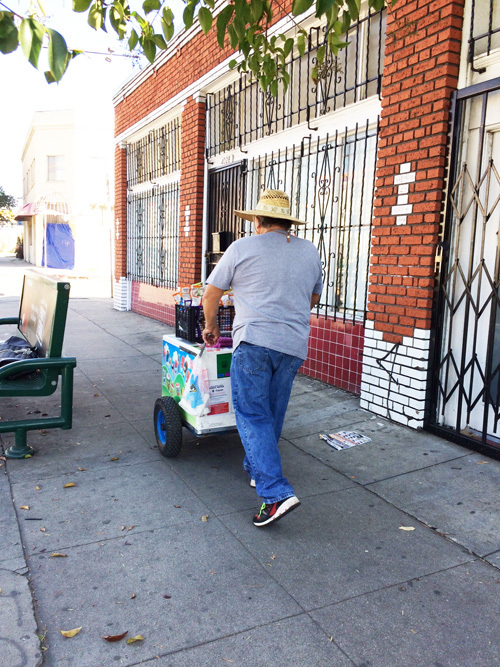 One of the motivations for the City Council to legalize street vending and create the permit system was concern that leveling misdemeanor criminal charges against vendors could make some undocumented immigrants a target for deportation. “I think the city of L.A. and this council has come a long way in terms of our view of street vendors. A few years ago, I didn’t think we would be having this conversation,” Councilman Jose Huizar said in February. “But the environment is correct — whether it’s the environment nationally or here locally — acknowledging the benefits that street vendors bring to us and the acknowledgment that we should bring them out of the shadows to contribute to the economy,” he said. The “national environment” Huizar alluded to was President Donald Trump’s stated intention to increase deportations of immigrants in the country illegally. The committees also approved a second motion that would amend the Los Angeles Municipal Code in a section that is still being used by enforcement agencies continue to cite vendors for “peddling” from vehicles or push carts, as the section was not included in the previous two sections that were altered to decriminalize vending. November 9, 2017 Copyright © 2012 Eastern Group Publications, Inc.